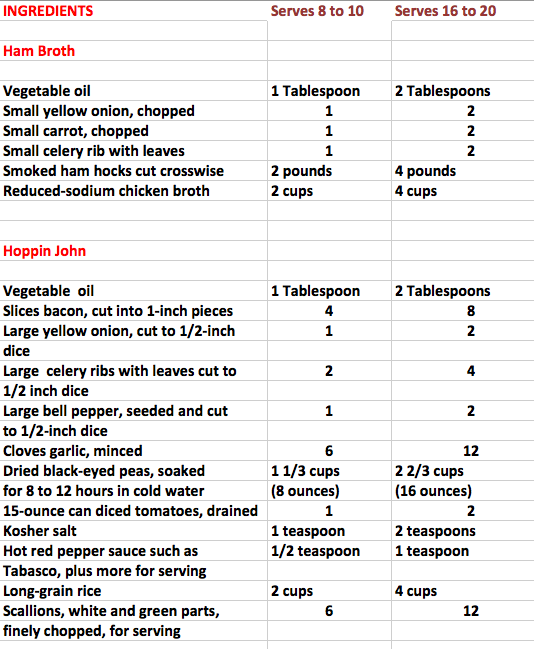 No one seems completely sure where the name Hoppin’ John comes from. According to Jessica Harris, noted authority on African cooking in the Americas, the only thing that all seem to agree on about Hoppin’ John is that the dish is “emblematic of South Carolina and is composed of rice and some kind of pea.” Field peas are thought to be native to Africa and were brought to the United States in early Colonial times, during the slave trade. After the peas were harvested, the plants were left for grazing cows hence the names “field peas” and “cowpeas.” . Just as nobody is sure of the origin of the name Hoppin’ John, no one seems quite certain why the dish has become associated with luck, or New Year’s. 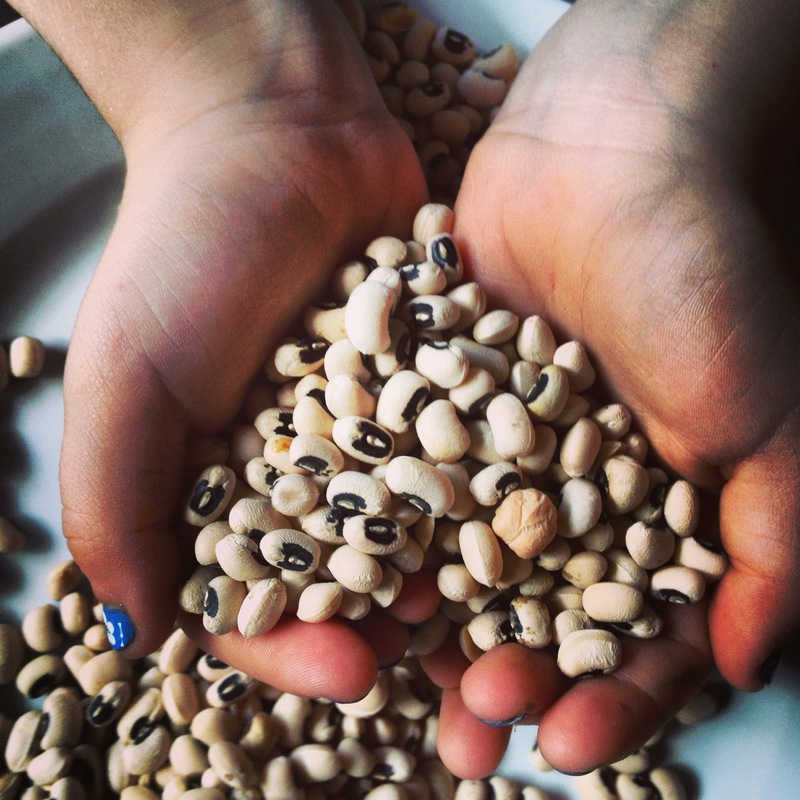 Some white Southerners claim that black-eyed peas saved families from starvation during the Union Army’s siege of Vicksburg in the Civil War. “The Encyclopedia of Jewish Food” suggests that it may come from Sephardic Jews, who included the peas in their Rosh Hashanah menu as a symbol of fertility and prosperity. Depending on the region, availability of ingredients and family traditions, there are as many versions of Hoppin’ John as there are cooks. In this big batch version by award-winning cookbook author and teacher Rick Rodgers from his book The Big Book of Sides (Ballantine 2014), Rick creates a delicious ham broth that can be cooled, covered, and refrigerated for up to 3 days ahead of time. Rick recommends serving this dish with boldly flavored main dishes including smoked or roasted meats, spicy sausages, sautéed greens and vegetables. Big Batch Notes: For 8 to 10, Rick used a stock pot (12-qt) for the stock, and a 6-qt large saucepan/Dutch oven for the John. For the double, he recommends using the same stockpot (12-qt) for both. Make the stock, strain, and then use the same washed pot for the beans. Also if making the broth ahead of time, make sure you have room to store it in your refrigerator. This hearty, full-flavored dish will warm you on the coldest January day. Please note that the beans need to be soaked 8 to 12 hours before cooking. Have your butcher halve the ham bones for you. Make ahead notes: The ham broth and its meat can be be cooled, covered, and refrigerated for 3 days. The Hoppin’ John is best made right before serving. 1. To make the ham broth: Heat the oil in a large pot over medium-high heat. Add the onion, carrot, and celery and cook, stirring occasionally, until softened, about 3 minutes. Add the garlic and cook until fragrant, about 1 minute. Add the ham hocks, broth, and 1½ quarts (3 quarts for the larger batch) cold water. Bring to a boil over high heat, skimming off the foam that rises to the surface. Reduce the heat to low and simmer until the meat on the hocks is tender enough to be cut from the bones, about 1½ hours. 3. To make the hoppin’ John: Heat the oil in a large pot over medium heat. Add the bacon and cook, stirring occasionally, until crisp and browned, about 8 minutes. Using a slotted spoon, transfer the bacon to paper towels to drain, leaving the fat in the pot. 6. Remove from the heat and cover the pot. Let stand for 5 to 10 minutes to finish cooking and soaking up the liquid. Transfer to a huge bowl, fluffing the rice as you do so. Sprinkle with the scallions and reserved bacon and serve hot, with hot sauce passed on the side. ** If you want to learn more about African cooking in the Americas, check out one of Jessica’s twelve books. In addition to being an accomplished author, she has been a National Board member of the American Institute of Wine and Food and a board member of the Caribbean Culinary Federation, the New York Chapter of Les Dames D’Escoffier, and the Southern Foodways Alliance where she was a founding member and also served as chair of the planning and then programming committees. Currently, she is a Board member of the Ogden Museum of Southern Art, The New Orleans Afrikan American Film Festival, an advisory board member of the Southern Food and Beverage Museum and the New Orleans Edible School Yard.